I’m sharing this because every penny counts for so many of us on this ride. I recently put a shopping extension on my PC called Honey and used it for the first time with great results. The Honey app not only searches for the lowest prices but finds coupons to apply to your online purchases, then tests them all for you. It takes just a few moments. The Honey extension was able to find me a $7.60 coupon in seconds, then applied it to my cart for me. The savings more than paid for the shipping of the socks I was ordering from Bombas to wear under my compression hose. Save on millions of products. Thousands of websites. From clothes to pizza, pay less for the things you’re already buying online. Honey works on most major browsers. 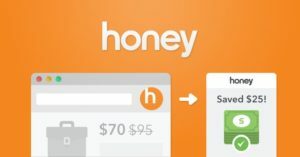 Honey app detects savings opportunities on Amazon and shows you the lowest price of all the sellers. So there you go. May the online coupon force be ever in your favor when hunting for products to increase your quality of life while you’re in this physical pickle!